Colleen Wakako Hanabusa (花房コリーン若子, Hanabusa Korīn Wakako, born May 4, 1951) is an American politician who served as the U.S. Representative from Hawaii's 1st congressional district from 2011 to 2015 and again from 2016 to 2019. She is a member of the Democratic Party and ran for her party's nomination for Governor of Hawaii in 2018, challenging and losing to incumbent Governor and fellow Democrat David Ige. In 2017, Hanabusa announced her decision to run for Governor of Hawaii in 2018 rather than run for re-election to the House. She challenged incumbent Democratic Governor David Ige in a primary. Ige defeated Hanabusa in the primary, and subsequently won re-election to a second term as Governor. Hanabusa is a labor lawyer with almost 30 years of experience, and a corporate officer in a family-run corporation. She has been recognized in The Best Lawyers in America, Woodward and White, Inc., served as a delegate to the Hawai`i State Judicial Conference, and was noted in Honolulu Magazine as one of Hawai`i's A+ Attorneys in 1993 and subsequent years. In November 1998, Hanabusa was elected as the state senator from the 21st District. The 21st District includes Wai'anae, where her family has resided for four generations, as well as Ko Olina, Kahe Point, Nanakuli, Ma'ili, Makaha, Makua and Ka'ena Point. She left the House at the end of the 113th Congress to run for US Senate in 2014, losing in the primary. After regaining the seat in 2016, she chose to run in the Democratic primary for Governor of Hawaii in 2018, leaving the House again after the 115th Congress. Although there was some speculation that she would run to succeed retiring Senator Daniel Akaka, Hanabusa opted to run for reelection to Congress. She faced Djou again, and defeated him with 54.6 percent of the vote. In May, Hanabusa was endorsed by Inouye's widow, Irene, who said, “Shortly after she was elected president of the Hawaii State Senate, Dan recognized that Colleen was more than capable of succeeding him and he began to mentor her. His last wish was that Colleen serve out his term because he was confident in her ability to step into the Senate and immediately help Hawaii." Hanabusa's campaign hired many of Inouye's staffers. Polling throughout the campaign was controversially mixed, with each campaign releasing different poll results. In the end, Schatz won a narrow victory (115,401 to 113,632). In May 2016, Hanabusa's successor in the House, Mark Takai, announced he was not running for reelection that year due to pancreatic cancer. Hanabusa subsequently announced that she would once again run for the seat. Prior to his July 20, 2016, death, Takai had endorsed Hanabusa to succeed him. Two weeks after his death, on August 3, Hanabusa announced that she would also run in the special election on November 8, 2016, the same date as the regularly-scheduled election, to finish Takai's term in the 114th United States Congress. On August 13, she easily won the Democratic primary for the general election. On October 24, Hanabusa resigned from her position as Chairman of the HART Board. She won both the special and general elections with more than 60% of the vote. H.R. 3320, a bill to increase funds for grants to U.S. owned Pacific islands to offset costs resulting from the residency of people from a Compact of Free Association (COFA) member-state, introduced November 2, 2011. Hanabusa introduced a similar bill, H.R. 1222, in the 113th Congress. In addition to the bills listed above, Hanabusa sponsored several bills relating to Filipino World War II veterans that would, among other things, recognize their efforts in World War II and provide veteran benefits to them. Hanabusa decided not to run for re-election to the U.S. House of Representatives in 2018 and instead ran for statewide office, this time for Governor of Hawaii. She challenged incumbent Governor David Ige in the Democratic primary. Based on polling as late as May 2018, she was favored to defeat Ige in the August primary. However, on August 11, 2018, Ige defeated Hanabusa 50% to 43%. Fellow Democrat Ed Case ran for and won Hanabusa's house seat, and took office in January 2019. ^ As pronounced by herself in " Obligation". ^ a b Goodin, Emily (November 3, 2010). "Dems pick up Hawaii seat". The Hill. Retrieved October 27, 2013. ^ Cheney, Kyle; Dovere, Edward-Isaac (August 16, 2014). "Brian Schatz edges Colleen Hanabusa in Hawaii primary". Politico. Retrieved November 22, 2014. ^ "Schatz, Hanabusa, Gabbard Win Hawaii Democratic Primaries". www.rafu.com. Retrieved 6 April 2018. ^ Duran, Nicole (November 14, 2016). "Three House lawmakers sworn in just before Congress ends". Washington Examiner. ^ "Rep. Hanabusa Comments on Anniversary of Forced Relocation of Japanese Americans". Big Island Now. February 20, 2018. Retrieved March 16, 2018. ^ "Honolulu Star-Bulletin News /2005/03/05/". Archives.starbulletin.com. Retrieved August 12, 2014. ^ "Faith on the Hill: The Religious Composition of the 114th Congress". Pew Research Center. January 5, 2015. Retrieved September 13, 2016. The number of Buddhists in Congress fell from three to two, as Rep. Colleen Hanabusa, D-Hawaii, lost her bid for a Senate seat. ^ "Members". New Democrat Coalition. Retrieved 2 February 2018. ^ Dayton, Kevin (May 25, 2016). "Hanabusa to run for U.S. House to succeed Takai". Honolulu Star-Advertiser. ^ Daysog, Rick (May 29, 2016). "Takai endorses Hanabusa in congressional race". Hawaii News Now. ^ Dayton, Kevin (August 3, 2016). "Special-election winner will finish Takai's term". Honolulu Star-Advertiser. Retrieved August 5, 2016. ^ Cole, William (August 13, 2016). "Schatz, Hanabusa, Gabbard cruise to victory in congressional races". Honolulu Star-Advertiser. Retrieved August 15, 2016. ^ Honoré, Marcel (October 28, 2016). "Longtime construction executive to replace Hanabusa on HART board". Honolulu Star-Advertiser. Retrieved November 7, 2016. ^ "Representative Hanabusa's Legislation". Library of Congress. Retrieved December 16, 2014. ^ "Members". Congressional Asian Pacific American Caucus. Retrieved 17 May 2018. ^ "Hanabusa Picked to Help Monitor Honolulu Rail Project". 1 June 2015. Retrieved 6 April 2018. ^ 28, 2016 October; 28, 2016 Updated October; 11:25am, 2016. "Longtime construction executive to replace Hanabusa on HART board". Retrieved 2017-03-01. ^ "Hawaii Gas names Colleen Hanabusa, Colbert Matsumoto, Catherine Ngo to board of directors – Pacific Business News". Pacific Business News. Retrieved February 27, 2016. ^ Eagle, Nathan (May 22, 2018). "Poll: Hanabusa Leads Ige By 6 As Primary Draws Closer". Civil Beat. Retrieved June 17, 2018. ^ "Primary Election 2018 – State of Hawaii – Statewide" (PDF). Hawaii Office of Elections. Retrieved August 12, 2018. 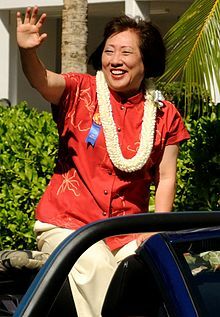 Wikimedia Commons has media related to Colleen Hanabusa.